Back in 2003, I bought my first MINI. Got it to 100,000 miles in the first 2 years. Just for grins, I recall running it through Kelly Blue Book to see what it was worth. If memory serves, I believe it was showing up as having a trade-in value close to $15,000. Not bad for 100K miles. Fast forward to 2012 when she had over 200K miles. I believe KBB had given me a trade in value of about $4,000. Fast forward to this week when I ran Bruce through KBB. 9 years old, 100K miles. KBB gives me a trade in value of about $2,200 or less! What happened to the value of MINI? The first generation MINIs really held their value. Like a BMW back in the early ’00s. Now, not so much. Possibly due to reliability issues of the R5X cars? Possibly due to the overall lack of build quality? Possibly due to MINI dealers offering incentives? I really don’t know the cause, I only know the affect. And I’m getting killed. I bought Bruce for several reasons. Bruce is an R56 Cooper with a manual transmission and no sunroof. A rare find. The interest that I am paying on the loan would make most of you shudder, but for me I was amazed I was able to get it as low as it is. I was expecting credit card levels and am below that. But, now I am upside-down 4x over on that car and my credit is substatially better. And since I don’t really like this car anyway (a story for another time), time to do something about it. 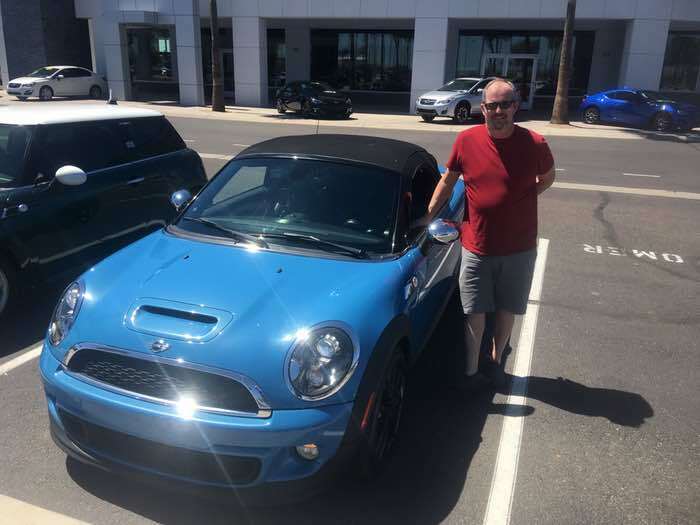 Earlier this week I found a 2013 MINI Cooper Roadster that ticked all of the boxes I was looking for. It’s Black and is in amazingly good shape. The previous owners probably never used sport mode on the transmission from what I could tell. Runs great, everything works, no leaks, top is in good shape. The only issue was some pretty good shaking starting around 80MPH that is probably due to a balance or alignment issue. Listed for right about $16K, I do my research on the VIN and KBB, where it shows a trade-in value less than $12K. Which means if I pay the full purchase price, drive it down the street to In-N-Out for lunch and come back to use it as a trade-in for another car, I would be out almost $5K! So I offered $12K. It was declined, as you would have expected. The sales manager thought I wasn’t very smart, telling me the dealer was into this MINI for $15K already and blah blah blah. I told him I knew that car had been on the lot for 30 days and the weather in Arizona will be turning from convertible weather to not in very short order. I thanked them for their time and left. I expect they will give me a call today or tomorrow with some kind of counter offer. If they do not, then I’ll be looking into refinancing options on Bruce. I haven’t had the chance to run any F5X cars through KBB but would be very curious if you have. Comments are open! Let’s hear the horror stories!